We present a detailed study of the statistical properties of the Agent Based Model introduced in paper I [Eur. Phys. J. 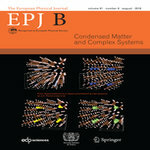 B, DOI: 10.1140/epjb/e2009-00028-4] and of its generalization to the multiplicative dynamics. The aim of the model is to consider the minimal elements for the understanding of the origin of the stylized facts and their self-organization. The key elements are fundamentalist agents, chartist agents, herding dynamics and price behavior. The first two elements correspond to the competition between stability and instability tendencies in the market. The herding behavior governs the possibility of the agents to change strategy and it is a crucial element of this class of models. We consider a linear approximation for the price dynamics which permits a simple interpretation of the model dynamics and, for many properties, it is possible to derive analytical results. The generalized non linear dynamics results to be extremely more sensible to the parameter space and much more difficult to analyze and control. The main results for the nature and self-organization of the stylized facts are, however, very similar in the two cases. The main peculiarity of the non linear dynamics is an enhancement of the fluctuations and a more marked evidence of the stylized facts. We will also discuss some modifications of the model to introduce more realistic elements with respect to the real markets.